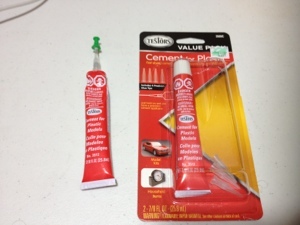 Do you need to glue plastic pieces? Are you making models, collages, or sculptures? (Why do I always begin these with a question?) Then lets check out Testors plastic model cement. This review shall be short as glue is glue. It does what it says it does, binding most plastics, but it has problems with gloss and such as most glues do. It does not bond metal or most other substances, it is purely for plastic-to-plastic gluing. Although it will stick your fingers and paper with it, so be careful when using it. It takes several hours to fully set but hardens in about half a minute. The only real problem with using it is its terrible odor, but that is common to all plastic glues. In short it is a very good glue, and that is why Testors is one of the most well-known brands in this line. There are better glues, and this is obviously not suited for every use, but that does not change how well it performs for the price. Just don’t get it on any paper products unless you want them to turn to very thin, stiff boards.